'VALUES ARE STARS OF THE LIMITING MAGNITUDE PER SQUARE OEG. catalogs identify these multiple stars and give their separations. Optical doubles which appear close together in the sky but are not physically associated cause the same difficulty. About 50% of stars brighter than ninth magnitude have another star brighter than ninth magnitude within 0.2 deg, and about 90% have one within 0.35 deg. The discussion here is limited to the three catalogs that are most useful for attitude determination: The Catalog of Bright Stars [Hoffleit, 1964], the Smithsonian Astrophysical Observatory Catalog [5.6-8], and the SKYMAP Catalog [Gottlieb, 5.6-17]. Each exists on magnetic tape and in printed versions. The Catalog of Bright Stars. The Catalog of Bright Stars contains approximately 9100 stars to visual magnitude 7.0 and is complete to visual magnitude 6.0. The HR number (the sequential index for the catalog), the HD number, the BD/CD/CPD number, and the star name (number or Greek letter and constellation) are given for each star when available. State-of-the-art* right ascensions and declinations are given in epochs 1900.0 and 2000.0. Position errors are not available. Proper motion and precession are given per hundred years. The Catalog of Bright Stars gives V and B — V magnitudes, which are slightly out of date, with about 50% of the star magnitudes quoted actually being the old and inaccurate photovisual magnitudes instead of V. Those stars having photovisuaL magnitudes are flagged. The B — V values are accurate, but additional magnitudes are now available which are not included in the catalog. Some spectral types are given, and these can be used to compute a B magnitude if only V is given as described by Gottlieb . The following multiple star data are given where applicable: separation, difference in magnitude between the brightest and second brightest component, and the number of components. An indication of whether each star is variable or not is given, but no other variability data is available on the tape versions. An appendix to the printed version lists the type of variable and the period. Smithsonian Astrophysical Observatory Catalog (SAO). The SAO contains almost 260,000 stars down to about tenth visual magnitude, and is over 98% complete to 8.0 visual magnitude. The SAO was created by merging a number of existing positional catalogs. It was designed to have at least four stars per square degree everywhere in the sky regardless of magnitude; therefore, the effective limiting magnitude of the catalog varies across the sky. The catalog gives SAO and BD/CD/CPD numbers. The absence of HD numbers is a serious limitation to the user who wishes to cross-reference SAO stars to other catalogs. * "State-of-the-art** means values which are as accurate as possible given the current data. Some current catalogs are compiled with older data. cited; these are accurate to about 0.5 magnitude. Some HD spectral types are quoted; however, like the magnitudes, the quality is poor. The SAO is not primarily a magnitude catalog and should not be used as one. No multiple star or variable star data are available. SKYMAP Catalog. The SKYMAP Catalog was prepared in 1975 specifically for attitude determination purposes. It contains approximately 255,000 stars down to 10.0 visual magnitude and is 90% to 100% complete to 9.0 magnitude, V or B, whichever is the fainter. It is impossible to establish the completeness level more accurately than this without extensive observational surveys. The catalog contains HR, HD, SAO, BD/CD/CPD numbers and star names. SKYMAP numbers are also assigned. State-of-the-art right ascensions and declinations are given at epoch 2000.0. Errors in position are quoted. Positions and errors in position were taken from the SAO catalog or the AGK-3 [Astronomisches Rechen Institut, 1975] when available (accuracy, about 1 arc-sec), and from the HD (accuracy, 35 arc-sec) for most of the remainder. Proper motion (also fromr the SAO) is given per year, and the sum of proper motion and precession is quoted per hundred years. Nearest neighbor computations, epoch 2000.0, including both multiple stars and optical double stars, are given for a variety of limiting magnitudes and magnitude differences. State-of-the-art values of V and B were taken from Blanco, et a!.,  and Mermilliod  (accuracy, 0.02 magnitude) or converted from photographic and photovisual magnitudes (accuracy, 0.15 magnitude) [Gottlieb, 1978 (in press)]. State-of-the-art spectral types were taken from Jaschek, et al.,  or converted from HD spectral types [Gottlieb]. For multiple stars, the separation between the brightest and second brightest component, the difference in magnitude, and the year of observation are given. Variable star data include the type of variable, the magnitude range, the epoch, and the period. Other data include the reddening index and the U (ultraviolet) magnitude. For many automated computational functions, it is convenient to maintain a rapid access core catalog consisting of only those portions of the star catalog that may be required during a single program run. To reduce the time needed to create such a core catalog, it is appropriate to presort the whole sky master catalog into smaller regions, or zones, so that only a limited number of zones must be searched to generate any one core catalog. A technique that divides the sky into zones that overlap in right ascension and declination by 50%(Fig. 5-13) was used for SAS-3 and HEAO-I, and is planned for HEAO-B and MAGSAT [Gottlieb, 1978 (in press)]. The use of overlapping zones has the advantage that the entire sensor field of view will always lie entirely in a single zone, provided the zone size has been chosen to be at least twice the diameter of the sensor field of view. 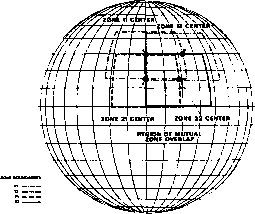 This simplifies specification of the zones required to generate the core catalog. Zone overlapping has the disadvantage that a single star appears in up to four zones. This redundancy increases the size of the presorted catalog with an attendant increase in read time and storage requirements. In the system illustrated in Fig. 5-14, zones adjacent in right ascension have the same declination limit and overlap in right ascension in the manner: 0 to 10 deg. 5 to 15 deg, 10 to 20 deg, 15 to 25 deg, etc. To prevent some of the redundant storage of data, stars can be stored in "half zones" (0 to 5 deg, 5 to 10 deg, 10 to 15 deg), which can then be merged computationally to simulate an original zone. Using this technique, no overlap in right ascension is required. A similar procedure does not work for declination overlap because the right ascension boundaries of two zones adjacent in declination will generally not align. 1. For three-axis stabilized spacecraft, a series of expected pointings will be known a priori or the analysis program must obtain a rough attitude each time a new pointing is reached. 360°sin y c spacecraft coordinates, [A] is the coordinate transformation matrix or attitude matrix (see Section 11.3), and y is the angle between the spacecraft spin axis and the sensor optical axis. 3. For slowly spinning spacecraft, the interval of analysis may be less than one spacecraft rotation, and a portion of the optical path defined above may suffice. where S is the star unit vector. For a spinning spacecraft, a star is included in the core catalog if y-p<cos"'(|S-Z|)<y+p where Z is the spacecraft spin axis unit vector. Although the core catalog is already limited to only those stars that might be required, it may still be too large to read each time an observation is to be identified. 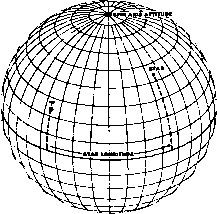 A rapid way of finding the desired star in the catalog is to compute catalog star longitudes, defined in Fig. 5-15. The longitudes of all stars in the core catalog can be computed (see Appendix C or subroutine VPHASE in Section 20.3) and the core catalog sorted in order of increasing longitude. A cross-reference table can then be created such that the /th position in the table refers to the first star with longitude greater than C i deg, where C is any desired constant. Therefore, to identify a specific observation it is sufficient to search longitudes in the range where is the estimated longitude of the observation and c* is the maximum expected error in the longitude. 1. Allen, C. W„ Astrophysical Quantities, 3rd edition. London: The Athlone Press, 1973. 2. Argelander, F. W. A., "Bonner Sternverzeichniss, Sections 1-3," Astron. Beob. Sternwarte Konigl. Rhein. Friedrich-Wilhelms-Univ., Bonn, 1859-1862, Vols. 3-5. 3. Armstrong, M. G., Generation and Use of the Goddard Trajectory Determination System, SLP Ephemeris Files, NASA TM-X-66185, GSFC, 1973. 4. Astronomisches Rechen-Institut, Dritter Katalog der Astronomischen Gesellschaft. Heidelberg, 1975. 5. 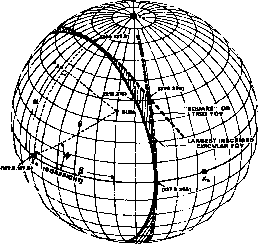 Bartels, J., "The Eccentric Dipole Approximating the Earth's Magnetic Field," Terrestial Magnetism and Atmosphere Electricity, Vol. 41, no. 3, p. 225-250, Sept. 1936. 6. Battin, Richard H., Astronomical Guidance. New York: McGraw-Hill, Inc., 1964. 7. Blanco, V. M., S. Demers, G. G. Douglass, and M. P. Fitzgerald, Publ. U.S. Naval Obs., 2nd series, Vol. 21, 1968. 8. Boss, B., General Catalog of 33,342 Stars for the Epoch 1950, Vols. 1-5. Washington, D.C.: Carnegie Institute of Washington, 1937. 9. Brown, E. W., Tables of the Motion of the Moon. New Haven: Yale University Press, 1919. 10. Cain, Joseph C., Geomagnetic Models From Satellite Surveys, NASA X-645-70-263, GSFC, July 1970. 11. -and Shirley J. Cain, Derivation of the International Geomagnetic Reference Field (1GRF10/68), NASA TN 0-6237, Aug. 1971. 12. Cannon, A. J. and E. C. Pickering, Harvard Ann., 1918-1924, Vols. 91-99. 13. Cappellari, J. O., C. E. Velez, and A. J. Fuchs, Mathematical Theory of the Goddard Trajectory Determination System, NASA X-582-76-77, April 1976.